With just days to go until the British Woodlands Survey 2017 is closed, we are pleased to report an encouraging response with more than 1,600 stakeholders taking part. 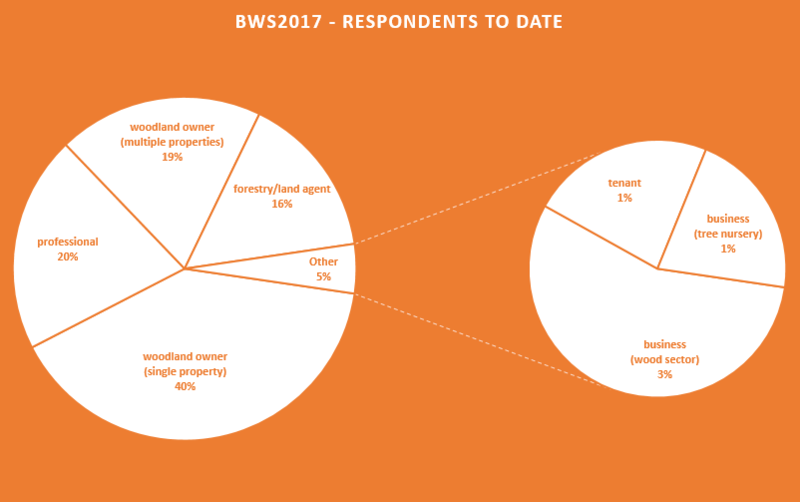 The majority (59%) of respondents have been woodland owners, with a wide cross section of those with other interests in woodlands and forestry also sharing their experiences and views (see chart below). The area of woodland represented by survey respondents considerably exceeds half a million hectares. The survey will close at 23:59 on Sunday 1st October. Owners, managers and community groups caring for woodlands in Oxfordshire are being asked to take part in an important survey. The small size of woodlands in Oxfordshire can limit the options that landowners have in managing them, and so may lead to neglect – affecting wildlife, landscapes and the rural economy. Oxfordshire County Council and the Sylva Foundation are working together to identify what support woodland owners may need to get the best out of their woodlands in the future. An online survey has been launched to gather views and opinions that will be used to improve existing and develop new support services for woodland owners and managers. 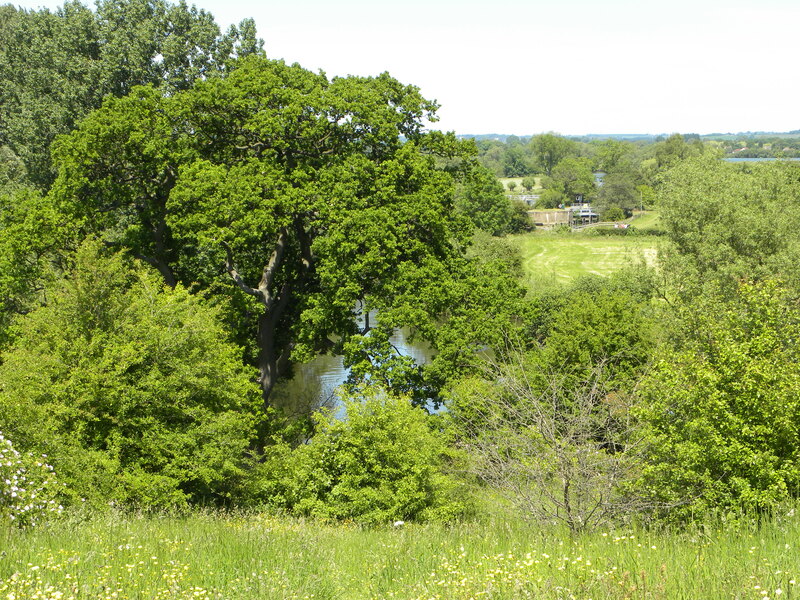 “Oxfordshire is unusual in having a large number of small woodlands in many different ownerships. We know that with improved levels of management these woodlands could be making an even greater contribution to the county’s future success. This survey will help us understand what challenges woodland owners face in getting the right support at the right time”. The survey will remain open until midnight on June 25th 2015. There are a maximum of 16 questions that should take approximately 5 minutes to complete. A report published today demonstrates that private forestry holds the balance of power in meeting the challenges of environmental change. Woodland managers will need courage to make forward-looking decisions to ensure our woodlands can thrive in future. Nine out of ten woodland managers have experienced environmental change in recent years, yet less than half believe the UK’s forests will be affected in future. 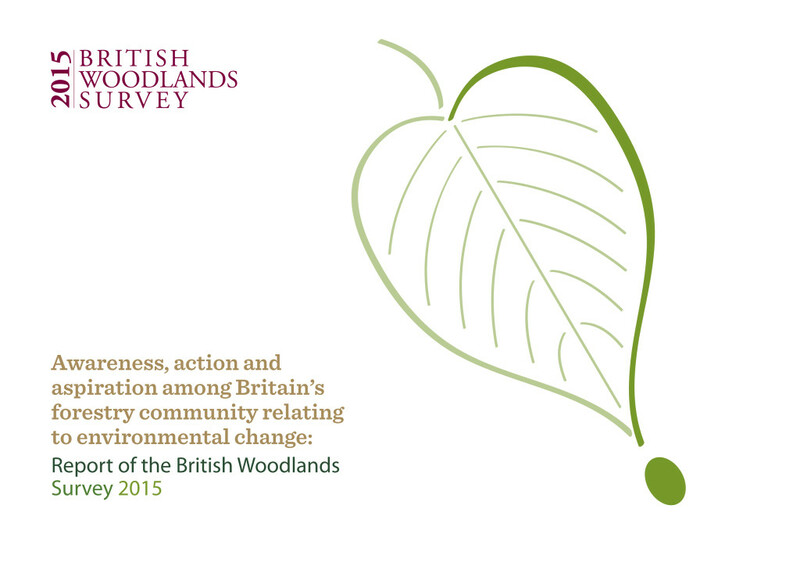 British Woodlands Survey 2015 report. Click to access. At the historic COP21 climate talks in Paris the world came together and agreed to reduce the effects of climate change. Our woodlands and the products they produce play a significant role in the balance of greenhouse gases, for example by storing carbon, while also providing many benefits for people and wildlife. However, unless our woodlands are able to adapt to environmental change — which includes not only surviving in a warming climate, but also coping with threats from pests and diseases, fire and flooding — then none of these benefits will arise. Our trees and woodlands need to be resilient or be able to ‘bounce back better’ in the face of threats from environmental change. Fortunately we have a forestry standard for the UK (the UKFS) that is recognised globally as exemplary. This includes 18 key guidelines that aim to ensure that our woodlands are able to adapt to environmental change. If woodlands are managed according to these guidelines then we could have some confidence that UK forestry is well-prepared for environmental change. Examples might include anticipating a warmer climate by choosing the best species to plant for future conditions, or by taking actions to limit the spread of pests and diseases. But are woodland owners and managers aware of their vital role in helping the UK respond to environmental change? Woodlands cover 13% of the UK’s land area and almost three quarters of this (2,283,000 ha; Forestry Commission 2015) is privately owned. This means that the actions of private woodland owners and managers, rather than public bodies such as the Forestry Commission, are likely to have the greatest effect both on the vitality of our woodlands, and on any contribution we can make to mitigating the effects of climate change. However, questions have never been asked of woodland owners and managers about their awareness, actions or aspirations relating to environmental change, or how well they may be following the guidelines of the UKFS. Earlier in 2015 a group of ten leading forestry and woodland organisations collaborated to run a national survey to address these questions; exploring awareness, action and aspiration relating to environmental change among private woodland owners and managers, and forestry professionals. The research was funded by Forestry Commission England, Sylva Foundation, University of Oxford and the Woodland Trust. Today the main report of the the survey is published. The survey attracted responses from 1509 people including: 827 private woodland owners; 182 forestry agents; 235 other tree and forestry professionals (e.g. NGO staff, forestry contractors); and 19 tree nursery businesses. Responses were received from across the whole of the UK: most private woodland owners were located in England, while agents proportionally represented more properties than owners in Scotland and Wales. The respondents represented an area of woodland, managed by owners or their agents, covering 247,891 ha; equal to 11% of all privately-owned woodlands in the UK. Results from the survey will be used by the collaborating group of organisations to develop an Action Plan. Earlier in 2015, the same organisations agreed to work together, and more widely, to prepare for environmental change by signing a Climate Change Accord (see below). Overall, implementation of the UKFS good forestry practice requirements for climate change adaptation is currently low. High awareness among woodland stewards of environmental change impacts may provide new opportunities to engage with woodland managers, particularly if focussed around issues of direct and local relevance. Professionals and agents were generally more aware and active in implementing adaptation measures than owners, indicating that existing sources of information and outreach activities among these groups are effective. Lack of information and advice available to woodland owners and managers to help them respond to existing and emerging threats surfaced as a key issue. A number of owners expressed a view that subjects covered by the survey were too technical. Existing assumptions concerning comprehension and knowledge of adaptation and resilience may be unrealistic. A dearth of contingency plans among owners and managers to deal with major events such as fire, pest and disease outbreaks, and extreme weather, is of considerable concern. Low awareness of climate projections for their locality, together with lack of knowledge of soils, means that most woodland stewards are unaware of the potential impacts of environmental change. Most owners have not reviewed species suitability under projected climatic conditions and are therefore unaware of the need to, and potential for, improving the resilience of their woodland. Uncertainty around the concept of provenance/origin, improved planting stock and genetic diversity points to a requirement for improvements in education and the communication of scientific and practical evidence. Low levels of awareness and action in relation to biosecurity among owners, which was only marginally better among professional foresters, suggests that there is a need to review whether current guidance on biosecurity and risk assessment is appropriate and provides directions for the design and communication of predictive modelling. Targeted funding to support actions which might benefit the resilience of woodlands, in particular pest (vertebrate and invertebrate) management and control, would be highly beneficial. Many of the actions for increasing resilience will flow from good management planning and levels of understanding of the issues, both of which appear to be insufficient. The high number of woodlands without a management plan will undermine attempts to improve resilience. The British Woodlands Survey (BWS) gathers evidence about the UK’s woodlands and those who care for them. It aims to provide a voice for private woodland owners and forestry professionals, and an evidence base on which future policies and practice can be developed. BWS2015 is the third survey in the series. The British Woodlands Survey is co-ordinated by the Sylva Foundation within its think-tank Forestry Horizons. The 2015 survey was supported by an Advisory Group comprising representatives of Climate Ready, Confor, Country Land & Business Association, Forestry Commission England, Forest Research, Natural England, Royal Forestry Society, Sylva Foundation, University of Oxford, and Woodland Trust. T20Q – top twenty questions for forestry and landscapes – is a global project that allows everyone to have a say about issues of importance. The questions received from contributors will be used to suggest new research or policy agendas, reveal knowledge gaps, and open up areas for further discussions across disciplines. They will also help identify new topics for systematic reviews of the science in key areas of forestry and landscape management. The survey builds on earlier work that identified forestry priorities through a participatory process and invited large numbers of people with an interest in forestry and integrated landscapes to suggest questions they felt had high priority for research and policy. As with earlier work, the T20Q process makes no prior assumptions about which topics are important. Questions will be collated according to their content and priorities will start to emerge as the conversation grows. The survey is primarily a vehicle for submitting questions online, but it will collect basic identifiers, such as age, gender, and stakeholder group, so that the topics suggested can be reported according to different regions, interest groups etc. If you own or manage “PAWS” woodland (see below to find out1), the England Woodland Biodiversity Group* would like to hear from you. They want to find out if you are considering restoring your woods to a native tree cover (or have already done so), as this is a great way to help woodland wildlife. They want to ask you about your approach to woodland restoration and what additional support you would find helpful. Please use the link below to the short web-survey asking for your views. Your answers to these questions will enable the group to identify what future support (policy and practical) is needed, and the scale of the opportunity and challenges. Your responses are very much appreciated. Please find the survey at http://www.surveymonkey.com/s/5L6JL5R. This link is for responses only. If you just want to preview the questions please use this link. The deadline for completed responses is 8th July 2013. 1If you are not sure whether your woodland is a “PAWS” you can check here. You can search for the Ancient Woodland dataset using the ‘Search for a Feature’ tool or search for a place, postcode etc. using the ‘Map Search’ tool. * The EWBG comprises representatives from Government, NGO and private sector woodland interests, and aims to identify, explore and escalate issues of national concern to woodland & forest biodiversity. The outbreak of ash dieback caused by Chalara fraxinea is a serious threat to the future survival of ash in Britain. 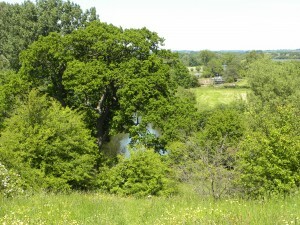 We want volunteers to Adopt an Ash in readiness for a major survey that we will launch in late Spring 2013. This is a new TreeWatch survey that is being developed with our partners. As one of Britain’s most common trees, the loss of up to 90% of ash trees across of our countryside and our streets, is expected to have a massive and long-lasting impact on the landscape and woodland ecology. You can help find ‘resistant’ ash trees across the country and track the development of the disease. Your data will be shared with a consortium of forestry and horticultural experts. By adopting your ash tree now you will be ready to take part in a robust scientific survey to be launched Early Spring, by which time the disease will be easy to spot. by asking volunteers to identify and report both the presence and absence of Chalara fraxinea, we will be able to track the progress of the disease on individual trees and across the country over coming years. For now we are asking volunteers to select trees that they will be able survey next year, and to ‘adopt’ them in the usual way at www.TreeWatch.com/chalara. By late Spring 2013 the disease will be easier to identify in our ash trees and we will open our survey in time to allow volunteers to report their findings. We will share tree data (note not personal data) with a consortium of leading forestry and horticultural experts.